Entering its 19th year as a staple of the retro-styled new car scene, reports Iain Robertson, the BMW-produced Mini has always been boosted, enhanced and repurposed more than its notional rivals, which is part of its survival routine. Since Volkswagen determined that its Beetle production would cease imminently, the Chrysler PT Cruiser having been terminated more than a decade ago, it leaves just the Fiat 500 (without which the Italian company would be lost) to rival the BMW Mini in the style stakes. Gradually, since the turn of the Millennium, the Oxford and Dutch and Austrian-built compact has enjoyed many new market introductions to keep its image alive. It is worth recalling how BMW obtained the Mini brand, in its sudden swoop, ingratiation of the British government and subsequent dismantling of what had been Austin-Rover, or as I called it ‘Rustin-Over’, a UK state-owned car manufacturing group. Demonstrating remarkable resolve, helped by access to considerable resources, BMW ‘inherited’ an intriguing history that it would soon use and abuse to its own benefit. When the first British-built Mini (at Plant Oxford) but German-funded (with UK grants) rolled off the production lines, it was heralded (mostly by BMW) as a rebirth of classical relevance. As if it had engaged with the services of the world’s greatest caricaturist, the number of blown-up/expanded design details of the original Issigonis Mini were both inspirational and laughable. The comic-book relevance commenced at the turn of the Millennium and the use of the word ‘Mini’ lost all of its power, notably because the BMW version was more Maxi-sized, a factor that would become increasingly obvious, with the passing of time and the introduction of new models. The first-generation, Brazilian-built petrol engines and then the introduction of a gutless Toyota diesel (mainly because the Mini was so heavy) were a virtual disaster, indicative of BMW’s typical ‘let the consumer carry out the R&D’ attitude, but with very clever marketing, they sold like hotcakes and broke into several new markets (where the old Mini would never have stood an earthly chance of survival). The subsequent use of a PSA turbo-diesel (now dropped) and increasing applications of BMW petrol engines, repurposed from rear-wheel to front-driven capability, added credibility to the BMW brand. Yet, BMW’s continued use of Mini’s heritage, as though it were a result of its own efforts, has always stuck in my craw. Of all the various models, the John Cooper Works versions have upheld a tradition of blending the conventions of relative normality, with the heart and soul of John Cooper’s racing heritage…even though John Cooper Garages no longer has any claim outstanding. From March 2019, the punchy combination of performance, handling and retro-styling benefits from a greater standard equipment offering in the UK, while meeting stricter Euro 6d-TEMP emissions standards. Fuel consumption, at 40.9mpg (6-speed manual; 46.3mpg, 8-speed automatic), and CO2 exhaust ratings (157g/km man; 140g/km auto) are improved in the hatchback version, while the convertible also shows similar improvements for its ex-3-Series, 2.0-litre, 231bhp, transversely-mounted turbo-petrol power unit. 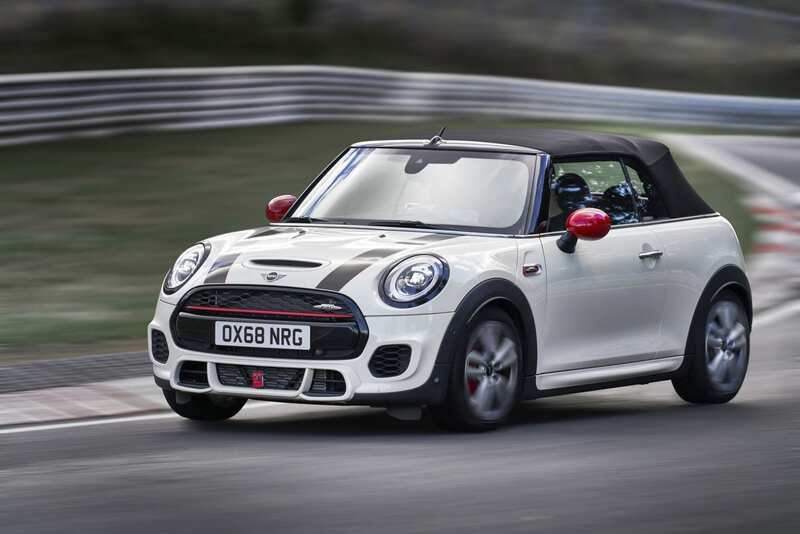 Fitted with the manual gearbox, the Mini John Cooper Works hatchback accelerates from 0-60mph in just 6.0s dead, the convertible trailing it by 0.3s, as a result of poorer aerodynamics and a significantly heavier and much-strengthened body structure. Top speeds are around the 142mph level. As the top models (other than the extremely focused and forthcoming GP1 version, which will be available in strictly limited numbers) the JCW variants manage to look quite different to lesser models in Mini’s line-up. The standard specification includes beefed-up Sport suspension, riding on 17.0-inch JCW alloy wheels, a red-callipered sports braking system and the slightly fussy and ugly aerodynamics kit. The cars can also be ordered with Piano Black exterior and interior trim, Dinamica leather, JCW bucket seats and spoked alloy wheels in black as part of the stock specification. As with each Mini sold in the UK, JCW models also benefit from standard-fit front and rear LED lights, automatic headlights and rain sensors, the Excitement Pack, which includes ambient interior lighting, exterior Mini Logo projection (from the door mirror housings) and additional detailing. The dinner-plate diameter speedometer housing is now a circular screen for the sat-nav and on-board computer, with both speedometer and rev-counter functions allocated to a pair of pods behind the steering wheel. There is still a row of rocker switches in the centre stack and a cramped lack of space in the fairly comfortable driver’s seat, with minimal space for much more than the family pets, or luggage, in the rear seats. The car is so style-conscious that practicality has been flung out of the window. Naturally, BMW’s engineers were always smart enough to reflect the unyielding ride quality of the original Mini in the new car and it continues in that vein. Pitching and bucking along country roads, in the BMW Mini, you could almost recall how uncomfortable the original Mini was. 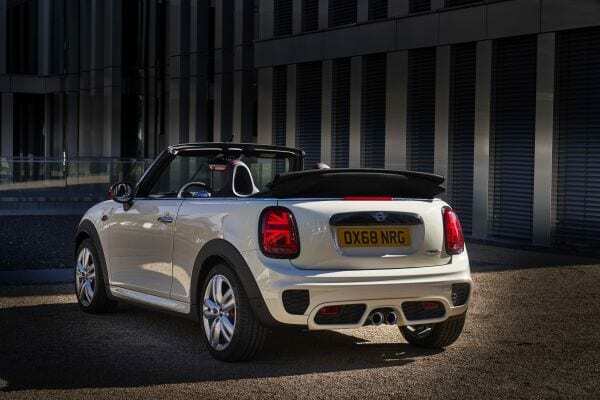 Both models sold from March 2019 will be equipped with petrol particulate filters intended to reduce particulate matter emissions across the MINI range. The petrol particulate filter is integrated within the standard sports exhaust system, to ensure that both models enjoy a ‘characteristic sound’ inside and outside the vehicle, while meeting the exacting demands of the future EU emissions legislation. BMW has sought very hard to make vital fuel economy gains, while lowering CO2 emissions of these cars. 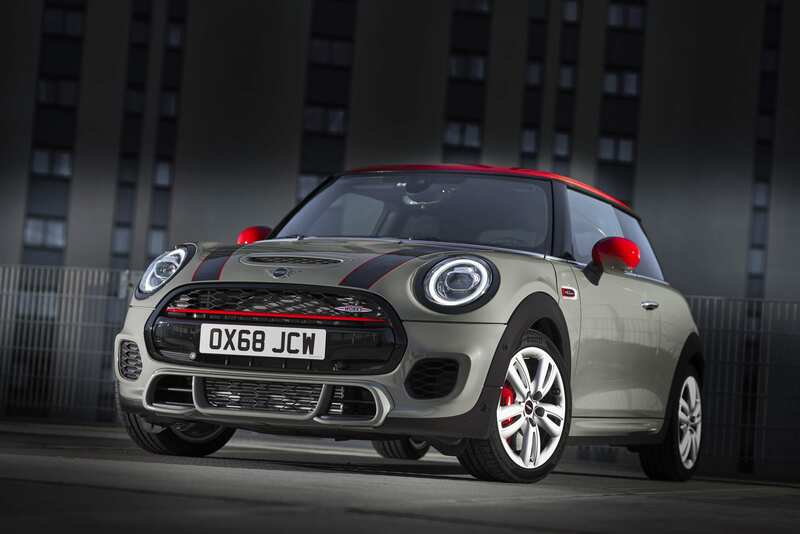 There is not quite the same level of crackle-and-pop of JCW models from the past but it still exists, which makes most drives moderately engaging exercises. While their on-sale date is in the early days of spring, in typical BMW form, you can order the cars almost immediately at your local dealer. 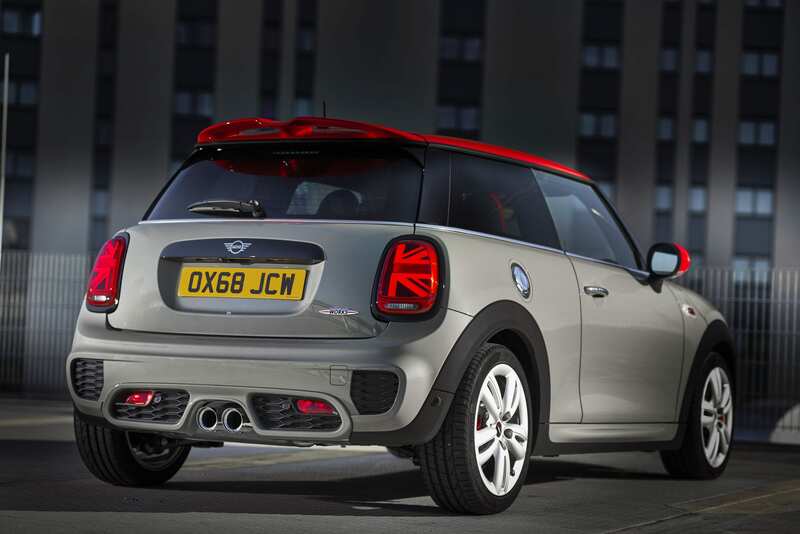 Although hugely cliched, the ‘Union Flag’ tail-lamps of the JCW are fortunately a delete option, if you really want to be mean, but, while Mini sales have plateaued around the world, it remains a popular choice in our domestic market, even though British production, supported by EU grants, is slowly being relocated to mainland Europe. Conclusion: If a Mini is what you simply cannot live without, then acquire one, I shall not discourage it. However, like part of a BMW master-plan, to provide a fairly costly entry-level to the Bavarian brand, Mini survives, British-built in some cases, but for how much longer? Who knows except BMW.